What is the Fair Funding Review? Central government funding for local authorities is based on an assessment of its relative needs and resources. The overarching methodology that determines how much funding each authority receives each year was introduced over ten years ago and has not been updated since funding baselines were set at the start of the 50 per cent business rates retention scheme in 2013/14. The methodology is very complex and involves 15 relative need formulas and several tailored distributions for services previously supported by specific grants. These formulas involve over 120 indicators of ‘need’, reflecting factors previously identified as driving the costs of service delivery. It is widely agreed across the sector that the formulae are overly complex, lack transparency and, as they have not been updated for a long time, are now out of date. 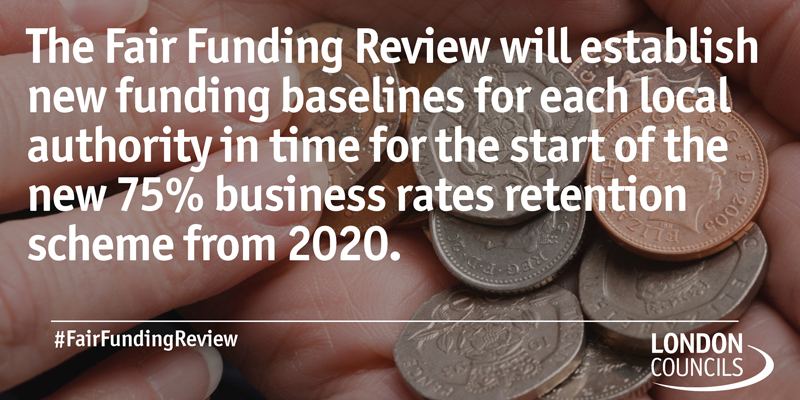 The government is therefore undertaking the Fair Funding Review to update the needs formula and set new funding baselines for the start of the new 75 per cent business rates retention scheme, from April 2020. The current funding formula determines how £17 billion of funding is distributed across English local government in 2018-19. London Boroughs receive around £3 billion of this funding. This is vital to ensure London boroughs can fund day to day services such as adult and children’s social care, housing and planning, environmental and cultural services. Since 2016, the Fair Funding Review technical working group has been considering and advising on how the new needs and resources assessment may be undertaken. It is jointly chaired by the Ministry of Housing, Communities & Local Government (MHCLG) and the Local Government Association (LGA) and meets every 6-8 weeks. London Councils is represented on this group. how to transition to the new funding baselines. Further technical papers are planned in the spring and summer to further develop the options for relative need, and to consider options for relative resources and transition. The timeline below shows the work being undertaken and key milestones the government has set out between now and April 2020 - when the new arrangements will come into force. There are many factors that drive the demand for and cost of services within London. The overarching drivers, however, relate to deprivation, area costs (linked to London’s unique labour and property markets), and London's changing population. Deprivation is the key driver of need in many demand-led services. Generally speaking, London has higher levels of relative deprivation than other areas, although this varies from borough to borough and, of course, within each borough. The government is looking at how to measure deprivation and how this should be reflected within the overarching needs assessment. It is important that the higher cost of housing in London are properly reflected within any income deprivation measures. Few people realise that, while average incomes in London are relatively high compared with the national average, Londoner's incomes, after housing are taken into account, are below national average. This has implications for rates of in-work poverty, which are higher in London than other areas. Any income-related data that may be used in the formula, including the 2019 Indices of Deprivation, must reflect those higher housing costs. It is also vital that the Area Cost Adjustment (ACA) continues to reflect London’s unique labour and property markets. Since 2013, when the current ACA was updated, London’s economy has grown faster than that of the rest of the country. It is important that this uses the most up to date data as some of the data that underpin the current ACA is over 10 years old. One of the principles set out for the Review for London is the “sustainability” principle. It is positive that the government has set out the intention that “the new funding formula must, as far as is practicable, anticipate future demand for services”. London’s population has grown by 13 per cent since 2010: over twice the rate of the rest of the country. It is forecast to continue to do so over the next 20 years. It is, therefore, vital that both the foundation formula and the service-specific formulas build-in future growth through projections, not static population figures as is currently the case.